Spring might finally be here. How about a fresh, crisp salad? When cutting back on sodium, salad dressing can be your undoing because a serving of of store-bought can contain 300mg of sodium or more. This version contains under 15mg, even if you drown your greens in it. 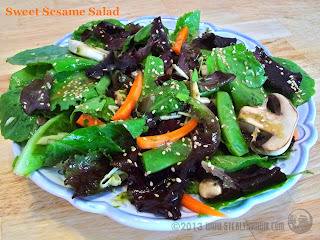 You will not miss the salt because homemade Sweet Sesame Dressing is rich and flavourful. Mix it up in minutes for a restaurant-style salad at home. I shared this post with weekly link-ups, where bloggers share natural recipes and homestead tips: Wildcrafting Wednesday, Simple Lives Thursday, the Homestead Barn Hop, Fight Back! Friday and Slightly Indulgent Tuesday.